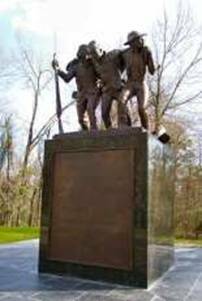 The African American Civil War Monument at Vicksburg consists of three bronze figures on a base of black African granite. Two of the figures are black Union soldiers, while the third is a common field hand. The field hand and one soldier support between them the second soldier, who is wounded and represents the sacrifice in blood made by black soldiers on the field of battle during the Civil War. The field hand is looking behind at a past of slavery, while the first soldier gazes toward a future of freedom secured by force of arms on the battlefield. In May and June of 1863, 1600 Black troops fighting and dying under the official label of United States Colored Troops (USCT) at Milliken's Bend, across the Mississippi River northwest of Vicksburg, made General Ulysses Grant's Siege of Vicksburg a success and brought that "Gibraltar of the Confederacy" crashing to the ground on July 4, 1863. President Abraham Lincoln was overjoyed, declaring that Vicksburg would be the key victory in the winning of the Civil War. He even proposed sending Grant, a notorious drunk in peace time, a case of the general's favorite whiskey. While still at Vicksburg in July, 1863, Grant was promoted by Lincoln to commanding general of all American forces and was ordered to Washington to deal with Robert E. Lee and the infamous Confederate Army of Northern Virginia. Lee surrendered to Grant after losing the battle of Appomattox on April 10, 1865. Lincoln was assassinated on April 15. And the war officially ended on May 10, 1865. A newspaper account of the celebration of July 4, 1864, the first year after the fall of Vicksburg, shows that the white people of Vicksburg pretty much ignored the holiday. Black people, by way of contrast, were rocking and singing with the Union forces just south of the city at Davis Bend on that great and glorious Fourth of July. "July 4, 1864, at Vicksburg was given coverage nationwide, since it was the first such holiday here after the surrender of Vicksburg in 1863," this writer wrote in his article posted on the web page "Notes from Black History." " Inside the city proper, nothing much took place on July 4, 1864. But at Davis Bend, a few miles south of Vicksburg, thousands of black and white pro-Union Americans rocked the river from noon until late in the evening. There was another official dedication to the Union Soldiers here in 1865, which can also lay claims to being the nation's first Memorial Day. Commemoration of the enormous efforts and sacrifices of the nation's soldiers was performed in a big way at Vicksburg for over half a century after the Civil War. At first, five black regimental posts of the Grand Army of the Republic (GAR), the equivalent of today's American Legion, in Vicksburg worked hand in hand with their white Union compatriots from across the nation to pay just tribute to those who had fallen in the Civil War. But after the Federal Government relinquished control of Mississippi to the resentful local whites between 1875 and 1885 (the decade of the infamous "Mississippi Plan"), the Memorial Day and July 4 celebrations became the sole responsibility of Vicksburg's five black posts of the GAR. While the Fourth of July celebration was reduced to a low-keyed affair in an increasingly Jim Crow Vicksburg, the May 30th (Memorial Day)celebration was kept alive until three years after World War I. The last of the black soldiers who had fought in Grant's Vicksburg Campaign died. In 1947, then-Gen. Dwight D. Eisenhower, the commander of the combined European and American forces in World War II came to Vicksburg and appealed to the local white leadership to celebrate the Fourth. His appeal had only minimal impact on the white supremacist local civic leaders of the time. The local whites, however, had a completely different agenda. Briefly put: Ever since Vicksburg fell to the Union forces on July 4, 1863, conservative and reactionary whites here have promoted the mythical "lost cause" of the Confederacy over the factual history and collective interests of the United States. While local blacks carried the banner for the United States on holidays in the post-Civil War decades, in recent times they, too, have begun to show a preference for the white, "Confederate" tradition over the black, "American" one, even if only by default. The black history web site master Bennie McRae says the role of black people in winning the Civil War has never been told. Enslaved men and women fleeing from the plantations, dubbed "contrabands" by General Benjamin Butler, formed a massive pool of labor support for the Union, McRae says. And their role was critical to the victory over the Southern Confederacy. "A lot of black individuals came into service prior to coming into the contraband camps and were recruited as laborers, cooks, nurses and so forth. There were thousands of them," McRae said during a broadcast Tuesday on Radio Station WMPR FM 90.1 in Jackson. "The exact numbers are unknown because inadequate records were kept on the support personnel. The military records are very adequate. All along the Mississippi Valley and in Arkansas and northern Louisiana, people flocked into the camps and were hired on as scouts, spies and in other support roles. "I'm not sure how highly skilled these individuals were at the time of recruitment," McRae says. "But they learned real quickly and were very effective in their job assignments in support of the Union Army." "One of the most famous of the black scouts was Alfred Wood, who served in the 3rd U.S. Colored Cavalry that was organized as the First Mississippi Cavalry. Such individuals played a prominent role in war effort. "In the official records, they show engagements at Milliken's Bend, Mounds Plantation and also at Lake Providence as well as Port Hudson as being part of the Vicksburg Campaign. And there was also the Louisiana Native Guard that played a major role in the victory at Port Hudson about seven days after the fall of Vicksburg. And they all consisted of black troops." The neglect of the role of black men and women in preserving the Union, as it was symbolized by the victory at Vicksburg on July 4, 1863, is being replaced by a growing concern for the preservation of black historical fact and issues around the nation. The national cemetery at Vicksburg contains the largest number Civil War dead of all the national cemeteries, even more than Arlington. More than 7200 black men who fell in and near Vicksburg during the Civil War remain buried there. They represent 40 percent of the 18,000 Union forces buried there. They are a bold reminder of this nation's debt to everyone who contributed to the Civil War effort and helped keep the United States of America intact.